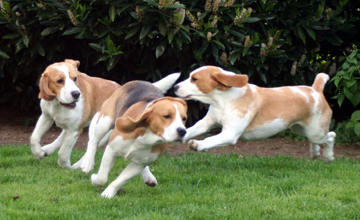 Beagles are the magicians of the doggie world - they’re great at disappearing! When I first moved into my current home the back garden seemed to be escape proof. But I hadn’t checked every square centimetre resulting in absent beagles. I found the areas that I’d missed, shored them up and I eventually ended up replacing the entire fence, and now I can relax if they’re running about out of sight for 5 minutes. If I’m looking for a home for one of my pups my preference is always to look for someone with a reasonably sized, well-enclosed garden. A large proportion of my dogs’ exercise is gained chasing each other around the back in the summer - it’s their playground. In the winter they don’t have the same opportunities so the “walkies” frequency is increased to compensate. It’s important not to over-exercise young pups when their bones and bodies are still developing - build up exercise gradually.